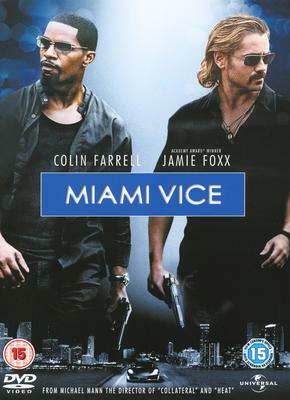 The soundtrack being a slightly layback mix over his previous films The Last of Mohicans Heat and Collateral, Miami Vice had a nicer, quieter mix without the earache and ringing in the ear sensation. Dialogue was clear throughout in the centre mix, while sound effects like cell phones and airplanes and speedboats swoop smoothly over the fronts with deep rumbling sounds like the occasionally car vibrating the chair is pleasing. 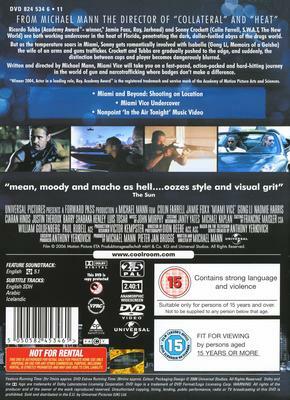 Split-surrounds with centre back and overhead was not as thrilling on this film, it was mostly up front on the three-screen channels. LFE.1 was hardly used in the film apart from no moment towards the end where 'Rico' Tubbs, played by Jamie Fox uses a grenade launcher and blows one big hole in a drug Barron! I still can't justify the ending feeling, "is that it"? With endings like Mohicans Heat and Collateral I could tell where the end was coming with an overwhelming feeling, but, I was only slightly let down, at least there was just one track on the end credits which I have set to A&B repeat "one of these mornings" by Moby. Visuals where edgy like Collateral, there was a lot of usage of night time shots or dark interior settings which gave sense of style to films overall look. This seems to be the norm with Mann's films now. It's the second time around now that cinematographer Dion Beebe and Mann have collaborated together I hope it continues. Well that's that, I hope next time for a better ending. THX isn't just all about crazy sub bass pounding you in the chest and rumbling the foundations of your home to pieces. It's more about reproducing the soundtrack with faithful reproduction. Still at £8.99 for this rental copy it was about on par to buy a ticket at the famous Empire Listener square at London's west end. How did that .50 cal sniper sound on that jbl?? nice eh? Spectacular deep and note too bright sounding, the EQ on this mix was tame not over the top like most Dolby mix can sometime. DTS was fantastic on mine. Boats sounded great.